Things have been really busy around here! Besides the constants of plants to water and harvest in summer, there’s animals to care for and ensure they’re protected from the heat of the day and ongoing development work in the garden. And then there’s the excess – mostly eggs, raspberries and basil at this house – and what to do with them. Lots of quiche, raspberry cheesecake, cordial, basil oil and pesto for the freezer at the moment. On top of that I’ve been writing a short story for my latest university unit (yes, Griffith Uni Online know no summer holidays!) which has been really quite demanding. Just when I thought it was safe to go back to the kitchen, I caught up with my friend Sara last week and she gave me a bag full of lemons. I was able to trade a bottle of Raspberry Vinegar Cordial, which has been threatening to take over my pantry cupboards! Well, I had a think about what works in my household. We’re not jam or marmalade eaters but dried fruit, cordials and syrups for drinks and ice cream are very popular. So I spent the afternoon peeling lemon zest for the dehydrator and making a simple Lemon Syrup with the juice. I confess I lost count of the lemons but it was at least 20. 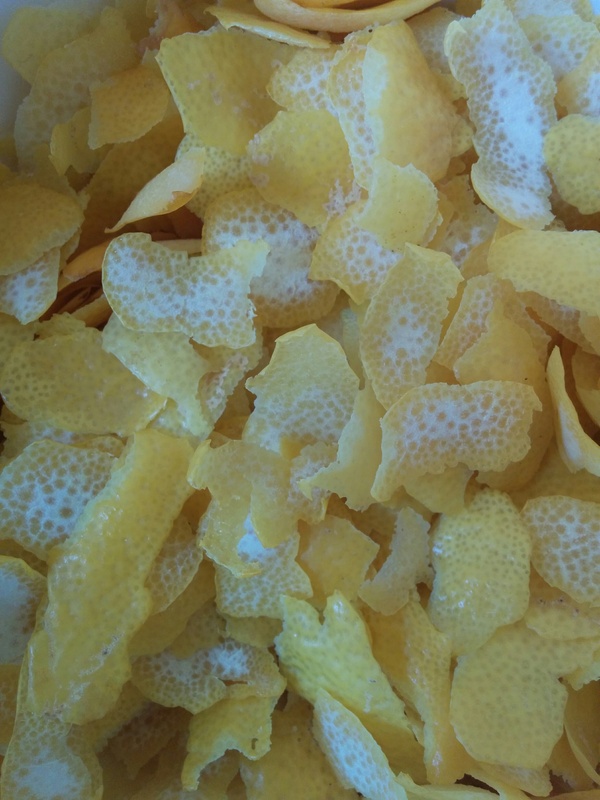 After peeling the zest I put it in a non-metallic bowl overnight while I dealt with the poor denuded lemons – they look awful without their beautiful skins! Here’s my recipe, it’s really easy! Before beginning, sterilise glass jars in the oven and put their lids in a saucepan of boiling water on the back of the stove. Next put the juice in a clean pan on medium heat with the white sugar. (I removed the pips but left some pulp in the juice – we like pulp). Keep stirring until the sugar is dissolved and simmer for about 10 minutes. Once the syrup is ready, take a couple of jars from the oven and carefully put them on a board or heatproof mat next to the syrup pan. Ladle it into the hot jars and seal immediately. 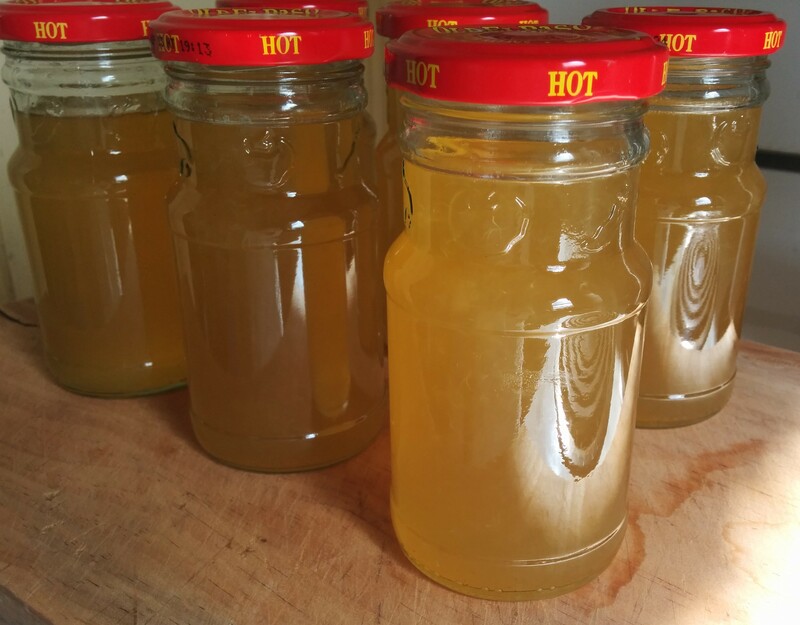 If you want to keep the syrup for a longer period of time, I recommend processing them in a water bath (canning method) for 10 minutes so they’ll be good on the pantry shelf for about a year – if it lasts that long! 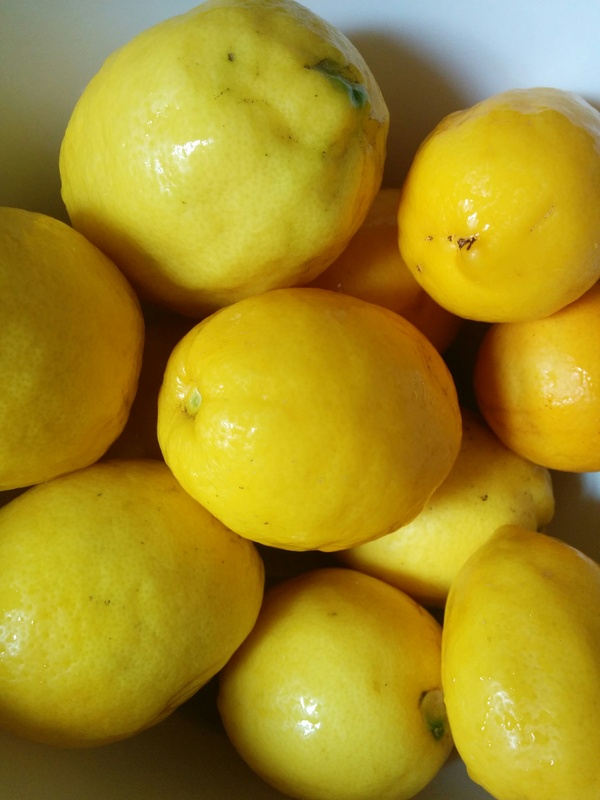 This is really very simple and one of the best bonus uses for lemons you know have come from a chemical free garden. 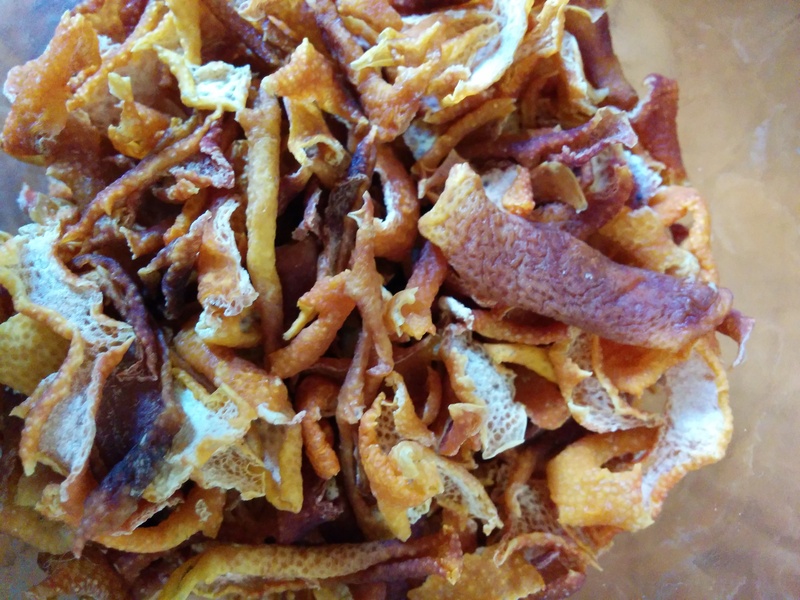 I have a dehydrator and my peelings were enough to put over three trays, lined with baking paper. In total it took about 10-12 hours to dry it all properly without cooking it. It it possible to do this in a conventional oven but it needs to be very cool. My three large trays reduced down to a jar of wonderfully dry, aromatic peel. I’ll use this in baking, marinades and plan to crush some up fine for mixing with salt, and some with dried chillies as a herb rub. Personally, I think it’s worth doing this just for the smell – it was heavenly! I’ll probably put another post up in the next few days about my favourite summer herb – shiso. Meanwhile, have a great weekend wherever you are and whatever you’re doing.